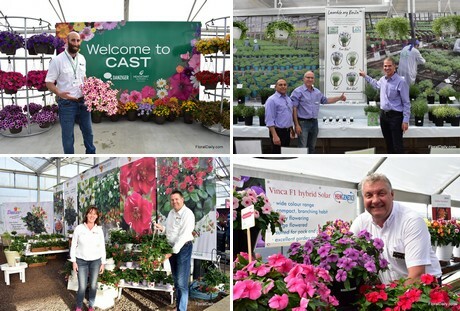 California was the center of the US floriculture sector last week, during the California Spring Trials. Growers, distributors, retailers and more found their way to 15 locations. There were tons of varieties on display and the participating companies did their utmost best to show the potential of their new, improved, existing and experimental products and ideas. FloralDaily was at the Trials to make an extensive Photo Report. In this report that we are publishing today, you will get an impression of the show and the highlights of every participating company. Later on, in separate articles, more pictures and information will be given on several varieties of each breeder. This year, several things struck the attention of visitors. First of all, the dates of the event. They were a lot earlier than usual which combined with the cold, rainy and dark days made it a challenge to get the varieties flowering on time. The bad timing of the event was of the most heard complaints of the event. "Usually, it is being held Mid-April, now it is almost a month earlier. It costed us and many others a lot of effort to force our plants in bloom on time, particularly with the weather we've had over the last couple of weeks", says one of the exhibitors. "On top of that, it is Spring break this week and hotels are therefore more expensive", says another exhibitor. Regarding what was on display, we noticed several general trends. Variegated leaves, changing flower colors, contrast of the leaves with the flowers, mixes and easiness of the crop throughout the chain. Click here to read the article on the trends that we published last week. All in all, the participants were pleased with the number and quality of visitors. Fortunately, the sun shined at most event-days which created an even more positive vibe at the different sites.